Marvel’s new event has me more baffled and annoyed than ever. But more on that in a moment. About 6-8 months ago, I decided, after a 15-year hiatus, to start collecting comic books again. The way I figure, there’s nothing holding me back like the budget of a minimum-wage earning teenager to stifle the enjoyment of a hobby that begs a collector to drop $30-$40 a week on the books, bags to protect the books, backs to support the book, and boxes to store the books. Moment before starting this post, I dropped $30 on 50 dividers for my boxes, allowing me to sort out my books with a glance at the long or short box the book resides. I spent $16 for two long boxes two days ago, looking to move my less-read Marvel and DC comics into a more permanent home. I need to drop some more money on some sort of holder for my boxes that get them at least 6-8 inches off the floor, in case of flooding. Theoretically, if the books are in bags, I shouldn’t, again theoretically, have to worry about water damage. But hell! If I’m spending $30-$40 a week on comics, I want to do everything I can to protect my, ahem, “investment” long-term. I use the word “investment” with some tongue-in-cheek. It’s what I tell my lovely and patient wife anyway. So. ‘Civil War II,’ and Greg’s (non-diagnosed, not-really-real) OCD. 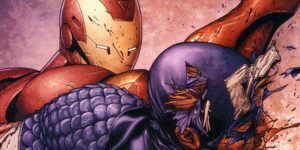 ‘Civil War’ was a major event in the Marvel Comic Book Universe. It pit Iron Man/Tony Stark against Captain America/Steve Rogers in a conflict of timely fashion regarding super heroes as weapons. It was covered lightly in the third Captain America movie, ‘Captain America: Civil War.’ In the middle of the conflict was Peter Parker/Spider-Man, and a number of heroes and mutants on both sides. Collecting that set had a main story line, then numerous, numerous tie-ins to other comics that helped explain the story from different angles and experiences regarding the protagonists of the comic sold: Spider-Man, New Mutants, X-Men, etc, had tie-in comics with ‘Civil War.’ There are NINETY EIGHT comics tying the event together, from prequel to post-event fallout, spanning numerous, separate titles. Where do I store them? Do I stick them with their main characters? Do I stick them together in a ‘Civil War II’ pile? The OCD collector in me is demanding, subconsciously, to buy two of every issue I collect to keep one with the ‘Civil War II’ pile, then one to keep the number increments on the main characters I collect correct as well. What do I do? 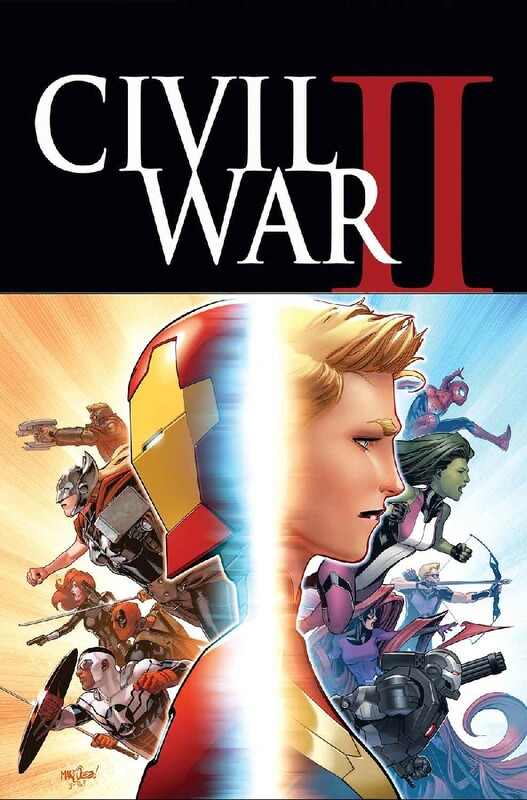 If I reach for ‘Civil War II’ to read, I’m missing parts of it in my box. I could get the trades later, which makes more sense, but then, what? What about the holes in my collection? There’s a part of me that gets wrist-wringingly anxious on how to manage that collection of books, how to sort when and where and what, and how to track it all. I’m torn. I don’t know what the best course of action is. When I was a kid, I didn’t even think of covers: I just threw them in a box, and that was it. Easy-peasy. It’s not happening that way now, and it’s making collecting a chore. I want to read the story lines so I’m abreast of the ongoing saga of the Marvel Universe, but a part of me just wants to ditch trying to handle them all and move to reading the issues I genuinely don’t care about other than event on Comixology or some other service. So. ‘Civil War II’ frustrates me. I’m getting in the way of enjoying it.